Day 14: Triple AAA Rated, 5 Star, First Class Hike, & Worldwide Bromance, Hoy! Guys trip! I forged some good, temporal bonds last night in the Albergue over Paia and vino. Everyone there was in their mid-thirties except me, Bugard from Germany (53) and Jose from Bilbao, Spain (55). We started the morning on another climb to the ancient Cross of Iron, the Cruz de Ferro, at the highest point of the Way. By my calculation, it was about another 1000 feet in a little deeper snow. The Cruz de Ferro is where you place something that is symbolic of something that is weighing heavy on your mind. I placed a beautiful picture of Lindy and me from 2006 when we started getting a little more serious with each other, the first time:) I was rather moved as I climbed to the top of the mound and realized this is the first “thing” I am leaving in Spain as her remembrance. Jose hugged me as he saw big tears in my eyes. Mind you, neither of us really understand each others language. The total mileage today was approximately 18 miles. If I thought the hike up was tough, I never thought twice that the hike down was twice as hard! It was a rocky road and my ankles hate me right now! All the guys from the night before seemed to gather at the same stops throughout the day, like the Cruz de Ferro or, we would meet at random tiendas and watering holes. Mateo, from Italy, Unai from the South of Spain, Marcella from Argentina stopped at the bottom of a 3000 feet decline for lunch in ciudad Acebo. We arrived at random times, and had lunch together and talked about how bad these ibuprofen are for me! We really hadn’t seen each other since Cruz de Ferro but, we seemed to always pick the same places to stop and recharge. One by one the guys piled in for lunch as others made their exit to get back on the trail. In Acebo, I found myself playing with a local puppy, Lumi! Stuck around for 15 minutes playing with the puppy and talking to Marcella. Then I was off. It was here the snowy mountains started their transition to lower, dryer ground. By the time I reached Ambros I couldn’t see any snow on the ground at ‘tall. I detoured in Ambros to Parle de Francias, a little restaurante, off the beaten path. I fell victim to their billboard. I stopped for a coffee, 2 bottles of agua and to recharge my phone! God knows I can’t live without my phone! As a side note, thank you Amber for the gift of the Gypsy Kings. I thank you and my ever growing iTunes account thanks you! They seem to always come on shuffle at the right time. I continued my descent into Molinaseca. This is the coolest town yet. I was even greeted by the cutest dog. He came around the corner and sat down as I crossed the bridge as if he was saying, “welcome!” Again walked into the homeliest bar I could see and had a coffee. lo and behold, there sat Unai, Jose and Juan from Gijón. Two cups of coffee and one beer later, we proceeded to walk the last 8 km to our destination, Ponferrada. We all checked into St Nicolas Albergue and I immediately dropped my pack and went looking for the bus station. I walked the entire town for several hours before finding the bus station. Booked my ticket for 5:15 am to take me about 40 miles from Santiago. I have a flight out of Paris on the 6th that would have cost me the price of a Hyundai to change! When I returned, all the guys from the night before and the day were waiting on me for dinner. I had to tell the guys I had to get a hotel (most Albergues won’t let you leave before 7am out of courtesy to the other pilgrims) so I can catch my bus. They wanted to take Mateo to dinner since he has to leave the Camino on a bus tonight for personal reasons. What a send off, really for both of us. Big dinner. Lots of vino and tons of stories, as these guys had been traveling together for several days. Good way to leave in my own again mañana. I am now in my hotel after tons of goodbyes and email exchanges. If I don’t seem all with it, it’s because I am beat and feeling down and depressed right now. I lay here feeling more lonely than I have since the start of the walk. Next Wednesday will be a month since my Lindy made her journey to Heaven. I miss her. Funny thing. My friend Sue, who lost her husband several years ago, told me to look for signs of communication from Lindy. When I placed that picture at Cruz de Ferro I picked up a random rock to mark the moment. 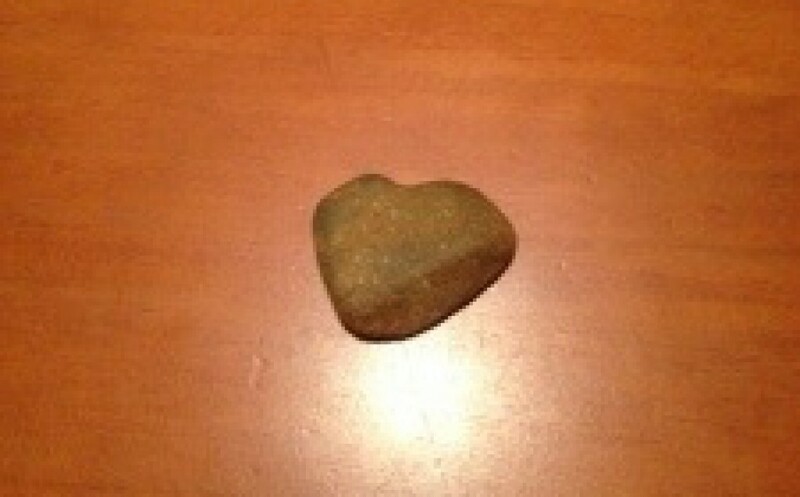 As I pull it out of my pocket right now, I realize it is shaped like a heart. I love you Lindy and I have shed enough tears to fill an ocean. I miss u more it seems everyday.